You can find a wide variety of wine gift baskets at discounted prices making it possible to keep your budget on track, especially during the holiday season. These types of gift baskets are perfect for last minute housewarming parties, as a special thank-you or as a gift for a host or hostess. Inexpensive wine baskets don't have to scream "cheap." 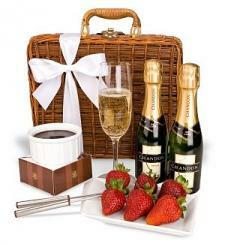 You can find a nice selection of wine gift baskets online at a variety of sites. The following sites sell beautiful wine gift baskets at great prices that will impress the recipient and save you money. Cabernet & Truffles Gift Basket: Priced under $30, this basket contains Santa Marina Delle Venezie Cabernet red wine and a variety of Sweet Shop handmade truffles. This set is presented in an elegant gift box. Crane Lake Duo: This gift set is priced under $40 and comes in an oval tin with a black and gold design. It contains one Crane Lake Cabernet Sauvignon red wine and one Crane Lake Chardonnay white wine. It also features Belgian chocolate truffles from Chocolat Classique, wafer cookies, and smoked almonds. Champagne & Fondue for Two: Priced around $45, this gift set is done in a cute picnic basket and contains two 187 ml splits of Chandon Brut Classic Champagne. It also include a fondue set for two. 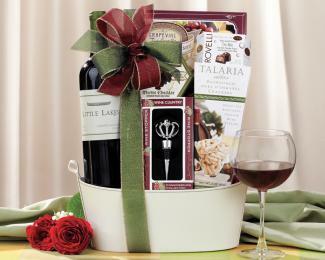 The Royal Treatment Wine Basket: This gift basket is priced around $50 and comes with your choice of two California wines. Choose from both red and whites. It also includes an assortment of snacks such as wasabi peas, roasted almonds, toffee peanuts, hot pepper cheese, and a cheese knife. Little Lakes Cabernet Gift Basket: Priced around $30, this basket includes Little Lakes Cellars Special Select cabernet and a decorative stopper. It also features Grapevine Trading Company sea salt and olive oil crackers, Vino e Formaggio merlot cheddar cheese spread, sourdough wine bites, and Rovelli Italian milk chocolate pralines. Cliffside Vineyards Syrah Basket: Priced under $30, this basket includes Cliffside Vineyards' Syrah and an assortment of food. Items include Grapevine Trading Company sea salt and olive oil crackers, Vino E Formaggio brie cheese spread and cheese knife, Red Thread Candy & Confections' candy apple caramels, and Talaria wine bites. Merry Merlot Gift Set: This wine set is priced around $30 and features a medium-bodied Merlot by Parducci. It also contains parmesan peppercorn cheese, crackers, and Ghirardelli chocolates. 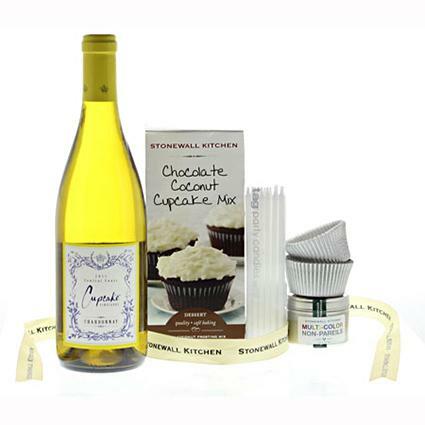 Cupcakes and Wine Gift Set: This gift set is priced around $50 and is cute and unique. It contains a bottle of Cupcake Chardonnay, as well as Stonewall Kitchen's chocolate coconut cupcake and frosting mixes. It also features colored non-pareils, white candles, and paper cupcake liners. Celebration Wine Duo: This gift set is priced under $30 and includes a bottle of Segura Viudas Aria Brut and a bottle of Veramonte Primus. Sparkling Wine Trio: This set of three sparkling wines is priced under $40. It contain a bottle of Poema Cava Brut, a bottle of Nino Franco Rustica Prosecco, and a bottle of Kenwood Yalupa Sparkling. Guilty Pleasures Dessert Wine Gift Set: This set is priced under $30 and contains wine and chocolates. You will receive one bottle of Fizz 56 Brachetto sparkling red wine and both chocolate covered cherries and chocolate covered strawberries. 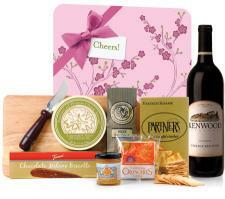 Thank You Gourmet Wine and Cheese Board Gift Set: This set is priced under $40 and contains a bottle of Kenwood's Vintage Red Blend, as well as an assortment of edibles such as Sonoma Jacks Pepper Jack Cheese, sesame crackers, Napa mustard, chocolate biscotti, and summer beef sausage. A wooden cheese board and cheese knife are included in this gift set as well. Look for unique wines at local wineries or specialty wine shops. Try to find something that the recipient may not purchase for themselves but make sure it is a variety that you know that they drink. Local wineries often feature their wines at discounted prices making it possible to get a great wine at a low price. You can use baskets or other interesting containers to hold your wine and gifts. You can find these at Wal-Mart, Michael's or even at a dollar store. Be sure to purchase tissue paper, padding for heavy items, ribbon and cellophane bags to complete the wine basket. For food themed baskets, shop at local or Internet gourmet shops for interesting items not easily found at your local grocery store. Chocolate and cheese are popular items that pair well with a variety of wines and won't cost a fortune. Some other items to include are crackers, fresh fruit, and hard candy. For a holiday basket, consider adding novelty items such as candy canes or Valentine's candy. These items do not cost a lot, but will add a special touch to your basket. You can even find ribbon that ties into the holiday theme to tie onto your gift basket. Carrying the items to the recipient is one of the best ways to ensure that it is delivered on time. However, if you are going to ship the basket, it is best to be sure of the laws regarding shipping wine. Some states prohibit shipping wines to other states. Internet wine merchants will advise you of any potential problems, as will your local post office.